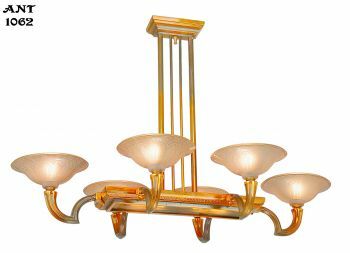 A fine chandelier that has elements of Art Nouveau and Art Deco together in one lovely fixture. Circa 1920-30 it is truly a lovely chandelier. When we finished re-wiring it with American sockets and re-doing the wiring, we all just stood there and admired this beauty. 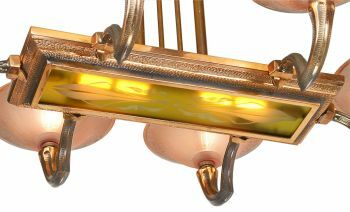 The metal is all cast with an old copper-bronze finish that was done during the Nouveau and deco periods. And the French did this finish the best bar none. It has bright copper places and dark shadows for accents and best of all.......it’s original and simply beautful. Beautiful as well are the magnificent etched art glass disk shades which the french glass makers did so well. And...the center panel does NOT match the color of those disk shades. Why contrasting colors (? )...who knows. We had a bit of trouble with the electrical sockets...since they were european......so....we just installed American chandelier sockets inside of the european sockets so we could continue to use the European socket to hold the outstanding french disk shades, as they have done for many years. 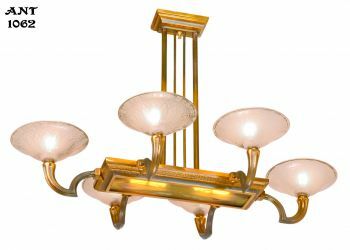 We are going to supply the same bulbs for this magnificent chandelier as we have used. 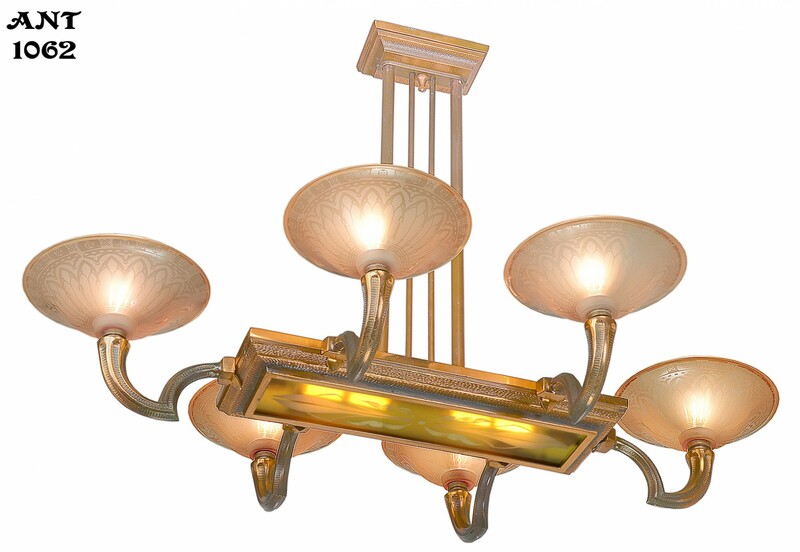 They are LED with Chandelier bases but much stronger than normal. As mentioned, this chandelier has been completely re-wired in our UL shop with new American sockets and all new wire. 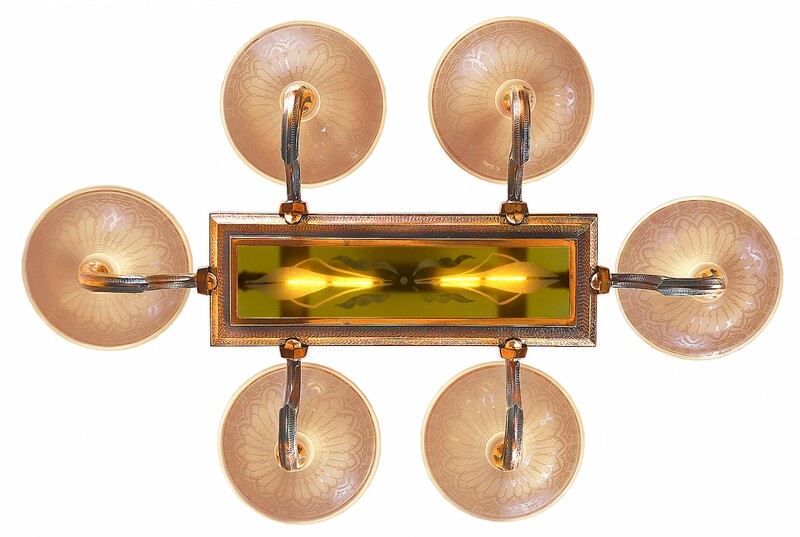 There are six normal chandelier base sockets...one for each shade..while there are two new chandelier sockets in the center section, into which, we installed our long tube LED bulb. We are very impressed with the magnificent casting quality of this chandelier as well as it’s decorative motif. While it was made during the deco period...it does have Nouveau elements and could be used in either scheme of decor. The main points here are...scarce style...good original finish...outstanding shades and re-wired to UL standards with American chandelier sockets. Measurements: The Overall chandelier height is 30”. The rectangular footprint is a significant 43” by 29” which could make this an outstanding light over a working island. 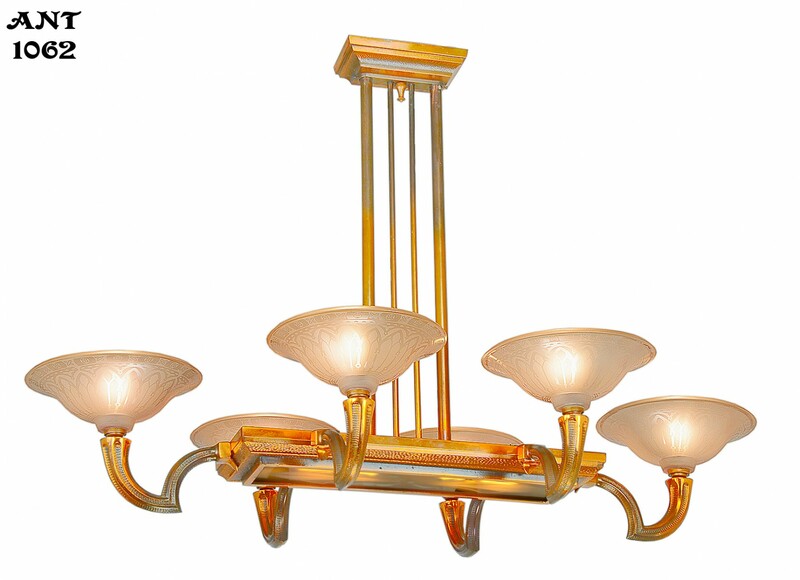 Price: Price for the chandelier is “only” $ 3,650.00 plus careful packing and shipping. 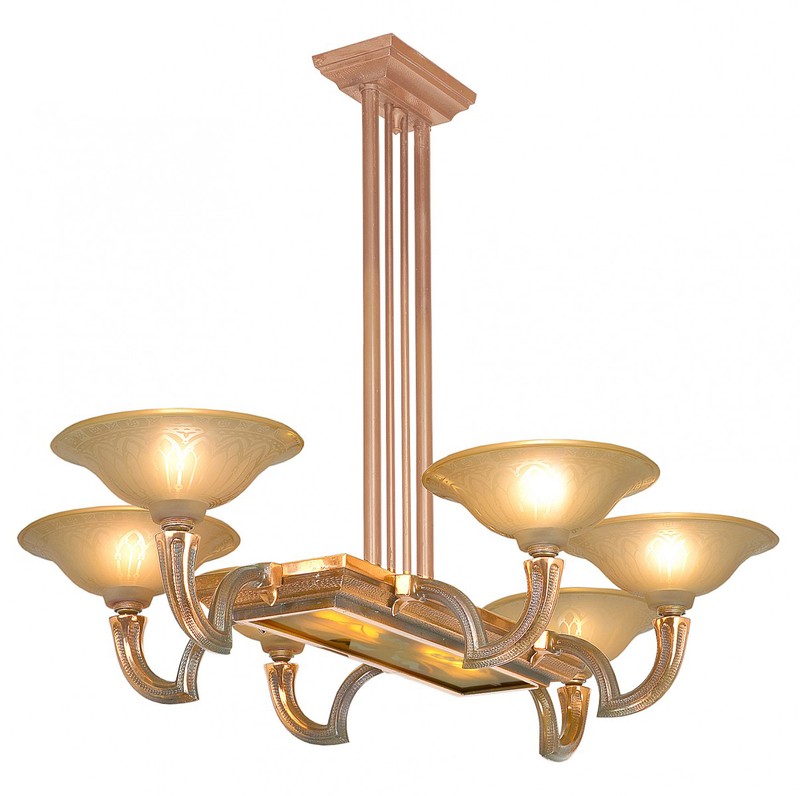 We say “only” because if you have done some chandelier shopping elsewhere, you will know that some folks are asking upwards of $8,000, or more, for a fixture of this quality, and often, not as nice as this one. We’re more realistic and believe that fair pricing is best.